PLEASE NOTE: we do NOT process CREDIT CARDS at the property !! At the hotel we only accept cash payments, WE DO NOT PROCESS CREDIT CARDS at our front desk. ATM for cash withdraw is available in Lasso, 5 miles south on Panamerican Highway. 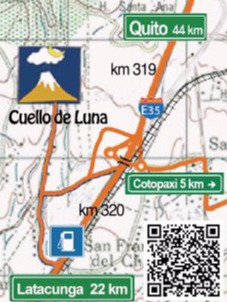 In order to reconfirm your reservation Hotel Cuello de Luna S.A. requires an advance payment. Usualy for the first night and 50 % of the tour price for tours and transportation to be provided and arranged by the Hotel. With the confirmation mail of your reservation, we let you know the specific amount of advance payment required, amount depends on booked services and season. Prepayments can be made with Paypal, wire transfer (US and CH $-accounts) and local bank deposit. For Paypal payments, there is no need to have a verified Paypal account, Paypal accepts debit cards and credit cards. In order to maintain prices low, our prices are NET and based on cash payment. Depending on the payment, fees and/or commissions charged to the customer may apply. For online payments with Paypal, eg. a commission of 5,5 % applies. In any case, Cuello de Luna will credit you with the net amount of the deposit on the final bill. If you make any payment, please drop us an email with name and reservation date to verify your payment and reconfirm your booking!